There seems to be quintessential decades that directors drop their Shakespearean iterations into. It’s inevitable to see some Shakespeare play set in the 50s, 60s, or 70s at least once in your yearly Shakespeare viewing. 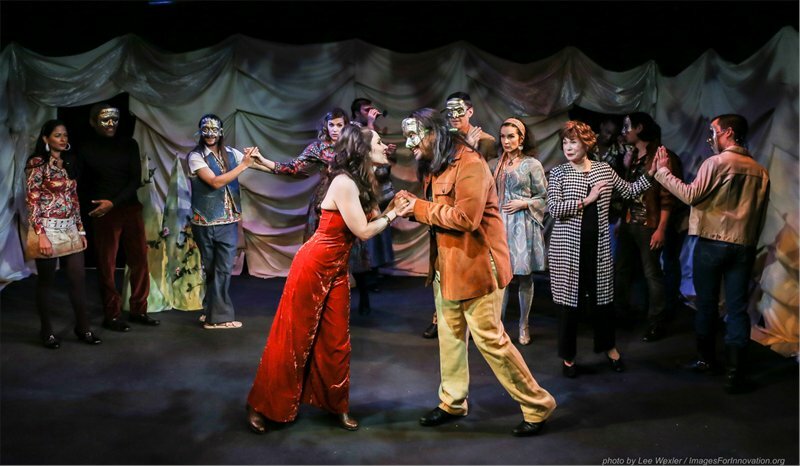 In Frog and Peach Theatre Company’s production of Much Ado About Nothing, the comedy is dropped into the post-Vietnam era to tell the story of romantic trickery. Regarded as a fan favorite, Much Ado About Nothing follows the feuding Beatrice and Benedick who are tricked to confess their love while Claudio rejects Hero at the altar after being tricked into believing she is unfaithful. Directed by Lynnea Benson, the soldiers at the start of the play are presumably returning home from Vietnam. Through costuming clues and the 60s and 70s infused soundtrack, Benson places the action in a world of bell-bottoms and velvet. When you pick a concept, it should be fully realized. For the most part, Benson did just that. But there’s that moment of contention that threw the conceit slightly off kilter. Part of the Vietnam War history in America centered around the draft and the hippies being forced to serve in the military. By going to war, it meant stripping away the hippie within, notably the hair. While there may not have been any steadfast rule about soldier hair in the Vietnam era, thanks to that little musical Hair, Claude appearing without his long locks served as a symbol and has been engraved in our theatrical memories. By having a Benedick with long hair, it personally threw the period off a bit. Though this may be slight in the grand scheme of the production, it forces you to look at all the other tiny choices in the production. With a plot that seems to borrow ideas from Taming of the Shrew and Romeo and Juliet, Much Ado About Nothing is a mashup of comedy, love, and drama. This production certainly leaned on the latter two. When it came to the comedy, Benson’s players didn’t quite earn many laughs. With some awkward physical comedy thrown into the mix in hopes to bring the funny, Much Ado About Nothing was sadly anything but. And much of that is due to the way the company approached the script. The ensemble was certainly filled with actors that have played with the Shakespeare canon before, but as a whole, they didn’t quite sell the material. Amy Frances Quint was overly affected as Beatrice. While she looked divine in her velvet 70s jumper, Quint tried to sell the language rather than let it speak for itself. Quint placed a physicality into every single world she spoke. It was a bit distracting. As Benedick, Lenny Ciotti was like a weird mix of Jack Black and Horatio Sanz. There was little endearing in his comedy but when he bears his heart, that’s when Ciotti was strongest. Ilaria Amadasi as Hero was a bit hard to understand, even when she slowed down her diction. Sadly, she was outperformed on stage by her love interest. Marcus Watson as Claudio was one of the only believable actors on stage. The other strong players included Samuel Douglas Clark as Borachio and Liz Tancredi as Margaret. Onstage unity is important for an ensemble to be cohesive. There was one actor who stuck out like a sore thumb simply due to, what can hopefully be assumed as, his character choice. Jonathan Reed Wexler clearly nailed down the villainous aspect of Don John but the volume and tone at which he recited his lines was quite harsh. For those who know "Saturday Night Live", the best way to describe Wexler is by comparing him to Jacob Silj, Will Farrell’s character that suffered from Voice Immodulation Syndrome. You could almost imagine him saying “I’m not screaming!” during rehearsals. Every line was delivered the same at a volume much higher than any other person on stage. From a design aspect, Much Ado About Nothing was a tad mixed. The soundtrack certainly evoked the era and Nina Vartanian’s costume design, for the most part, paid homage to the 70s fashion. But the set by Ashley Cusack was whimsically in a world of its own. Cusack’s fabric dropped walls and cone-like trees were nice to look at but they didn’t add anything for this particular concept. It felt closer to what you would imagine for a production of A Midsummer Night’s Dream. Frog and Peach’s production of Much Ado About Nothing was nothing to write home about. Aside from the tiniest of conceptual details, there was just something lacking from setting this production apart.